In almost every ditch in Holland with reasonably clean water we will in summer find slimy masses of filamentous algae, floating as scum on the surface. It looks rather distasteful, but a ditch like that is not polluted, only eutrophic (rich in nutrients). In spring these filamentous algae grow under water but when there is enough sunlight and the temperatures are not too low, they produce a lot of oxygen, sticking in little bubbles between the tangles of the algae. These come to the surface and become visible as slimy green masses. In these tangles we will find mainly three types of filamentous algae, Spirogyra, Mougeotia and Zygnema. In this article we will mainly write about Spirogyra. From a distance these slimy tangles look perhaps a bit dirty, but under the microscope the filaments are very beautiful and moreover, they have a spectacular way of reproducing. 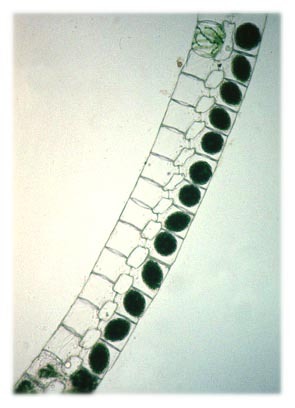 Spirogyra owes its name to a chloroplast (the green part of the cell) that is wound into a spiral, a unique property of this genus which makes it easily to recognise. In The Netherlands up till now there are found more than 60 species of Spirogyra , in the whole world more than 400. For the determination of a species it is necessary to look for reproducing specimens with spores. But a precise determination is not necessary for learning a lot of interesting facts from Spirogyra. It is easy to see that there are many species ; in a clean, eutrophic ditch with hard water in Holland we will find easily 20 different species. 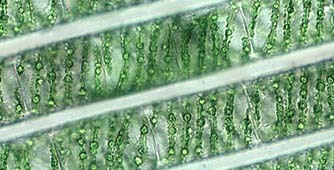 If we look at a filament of Spirogyra with the microscope, the first thing that attracts attention is the chloroplast, a narrow, banded spiral with serrated edges. The small round bodies in the chloroplast are pyrenoids, centres for the production of starch. In the middle of the cell we see the transparent nucleus, with fine strands linking it to the peripheral protoplasm. The filaments contain cells of different sizes and it is easy to find a new cell, just formed after a division. The really interesting part comes as Spirogyra reproduces sexually. When two filaments are close together, the process starts. Cell outgrowths form connections between the filaments and a sort of ladder is formed. The contents of the cells in one filament will go through the connection tubes to the cells in the other filament. A zygospore is formed with a thick cell wall, round or oval and with a brownish colour. This conjugation process takes place especially between half May and half June. The spores are liberated, sink to the bottom and germinate in the next spring to form a new filament. It is very worthwhile to look in a sample of algae for the different stages of this conjugation process. It is always a nice surprise to find the conjugating filaments. Spirogyra can also exhibit, apart from the ladder like conjugation, another form of conjugation. Two neighbouring cells in the same filament can connect via a tube. 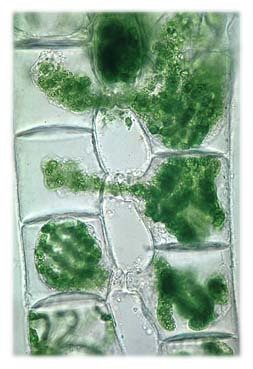 There are several other genera of related filamentous algae; Zygnema and Mougeotia, with respectively star like and plate like chloroplasts. These genera live in general in more acid, soft fresh water. The conjugation figures look different from those in Spirogyra, for instance X-like. Dune pools are a rich biotope for Spirogyra. In ditches the amount of species declines when the water becomes very eutrophic. Other filamentous algae then replace it, like Cladophora, Vaucheria and Enteromorpha. In the end we only will find duck weed. Then a ditch does not receive light, with disastrous consequences for the growths of plants and the production of oxygen. Comments to the author Comments to the author sent via our contacts page quoting page url plus : ('jparmentier','')">Jan Parmentier are welcomed.